Spath (Spathiphyllum spp. ): growing, planting, caring. Peace Lilies are related to other aroids, like anthurium and alocasia : typical of aroids, the white flowers emerge from the leaf stalk surrounded by a cupped white spathe that gradually fades from pure white to a greenish or yellow colour over time. Scientific name : Spathiphyllum spp. 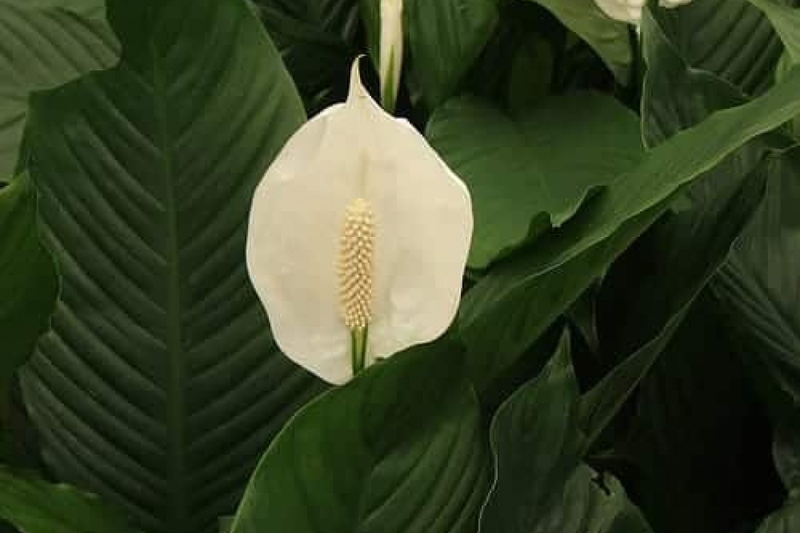 The Peace Lily - spathiphyllum - is a favorite houseplant that offers majestic, long-lasting white blooms in spring, and glossy oval leaves with a striking point that emerge from the soil. They are tropical plants native to the rainforests of South America that do very well when potted indoors under the right conditions. Spathiphyllums are usually grown indoors. There are all kinds of hybrid spathiphylla, as well as the widespread species "Spathiphyllum wallisii". They are large-leafed, long-stalked, glazed, green-colored and lanceolate, with strongly marked parallel veins. The flowers recall those of the arum. At the end of a long stem, like a veil, an elegant white bract, called "a spath" surrounds an erect spadix, cream-colored. The slightly fragrant inflorescences bloom from the end of spring until the end of summer, but with very good conditions, you can get flowers all year long! In our climate, spathyphillum settles inside our homes and apartments: it grows well when the temperature is around 20-22 ° in summer, and a little cooler in winter. Install it in a good sized pot, with special potting soil for indoor plants or flowering plants, and ideally place the pot on a bed of clay balls or small pebbles that you will keep moist. Spath needs light, but protect it from direct sunlight. Avoid close proximity to a radiator, which would dry the air. Do not hesitate to approach them from a window, sheltered from drafts, which they do not appreciate! In winter, they will fare better in a room a little cooler or next to a window facing north, to rest! The spathyphillum better withstands excess watering than a period of drought. In spring and summer, water regularly, but moderately: wait until the soil is dry on the top between 2 waterings. The foliage needs some moisture, so you spray it regularly with water without limestone! In autumn and winter, reduce watering as the plant rests. If the ends of the leaves of your plant turn brown, the air is too dry! Remove the most damaged leaves and move your plant away from any radiators, misting its foliage regularly. You can also place the pot on a bed of clay balls; the water, poured in excess, evaporates while moisting the air. If stains appear on the leaves, it is that there is an excess of watering or that the air is too fresh. Stop any water input for a while. If your plant does not bloom, it's probably because it lacks brightness! Change its location by bringing it closer, for example, to a window, but away from drafts! Sometimes subject to aphids or mealybugs, it is in relatively dry air that spath is most prone to diseases and pests such as the red spider. Spray non-calcareous water regularly on the foliage to create a moist environment to avoid them! Prefer late fertilizer. Do not put too much fertilizer, which causes rapid growth and weakening of the plant against parasites and diseases. Repot in the spring every 2 to 3 years, to change the substrate! You can also replace the first few centimeters of soil, without upsetting the roots. Feel free to find your spathiphyllum a spot outside in the shade, on the terrace or balcony! A spath outside may not survive winter: get it back home!